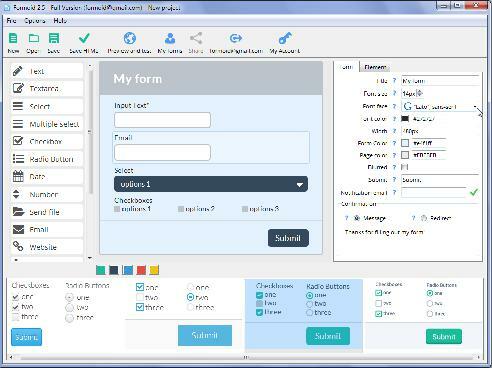 Formoid is a free desktop app that helps you easily create html5 contact form, jquery ajax form, joomla contact form, jquery form validation and more in a few seconds without writing a single line of code. Create awesome online forms in just a few clicks. I have been trying to get the form that I created with Formoid 1.6 to work. The form has several elements including reCAPTCHA. When I tested it with that option from the menu, it worked just fine--including the reCaptcha. It gave an error message when I tried to send it without typing the two challenge words, and then when I typed them correctly it sent the contents of the form, displayed a Thank You message and I got the results in my email. However when I clicked Save HTML and got the html, php and folder and then uploaded them to our server and tested it again from the actual website, it failed to work properly. When I didn't type in the two reCaptcha words it did NOT give an error message as it should have, it seemed to send the contents of the form in that it cleared the form but I didn't get anything in my email. When I typed in the two reCaptcha words and clicked Submit, it cleared the form but failed to give the Thank You message and failed to send the contents of the form to my email. I followed the directions on the Quick Help page http://formoid.com/index.html#help. The only difference that I can see is that I called my html page that it created sendform.html rather than index.html. I already have an index.html for my website. Since I chose that name when the html file was created, the other two components--php and file folder also have the same name. I have tried this over and over again, always with the same results. I got another idea. I made a folder named sendform and saved the form html html into that folder and called it index.html. Then I uploaded the whole sendform folder to my server space. But that didn't work either. I'm using an iMac with Snow Leopard 10.6.8, Chrome browser version 26, Formoid version 1.6. A: Try to indicate php file directly (if the server uses index.html instead of index.php). Please, try also the latest full functional version of Formoid.